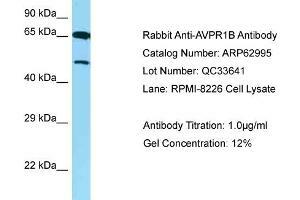 Characteristics This is a rabbit polyclonal antibody against AVPR1B. It was validated on Western Blot. Background The protein encoded by this gene acts as receptor for arginine vasopressin. This receptor belongs to the subfamily of G-protein coupled receptors which includes AVPR1A, V2R and OXT receptors. Its activity is mediated by G proteins which stimulate a phosphatidylinositol-calcium second messenger system. The receptor is primarily located in the anterior pituitary, where it stimulates ACTH release. It is expressed at high levels in ACTH-secreting pituitary adenomas as well as in bronchial carcinoids responsible for the ectopic ACTH syndrome. A spliced antisense transcript of this gene has been reported but its function is not known.